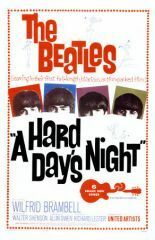 This film is a classic, and beloved by Beatles fans. And it also features the fab four running around London, being wacky, so it clearly appeals to us as well. This is the earliest film we've featured that shows the actual London, not a studio built to look like London. London's changed a lot in the last 46 years, so there wasn't a whole lot we recognised though. We're perhaps not best suited to judge the London accuracy of that time, as we weren't born yet, but it's always fun to see the London of yesteryear. The first thing that jumps out in this film is that John, Paul, George and Ringo are not actors. Adorable? Yes. Charming? Yes. Actors? Oh my, no. The plot of the film, such as it is, features the boys travelling from Liverpool to London to perform for a TV broadcast. Paul's grandfather (Brambell) tags along for the ride and gets into all sorts of mischief. Oh, and those pesky female fans keep chasing the guys, and all they want is a quiet moment to ... meet some girls. We guess it's hard to have a meaningful relationship with someone who's screaming at you. Paul's grandfather keeps running away, and gets the guys into all sorts of trouble. He runs up a gambling tab at Le Cirque, using Ringo's invite to get in, and the guys spend a lot of the film searching for him. Poor Ringo is punchline of most of the jokes in the film. (Grandfather: "It's your nose, you know. Fans are funny that way, they take a dislike to things.") He develops a complex about this and runs away. That's actually when we see the most recognisable bits of London: he heads to Notting Hill, and runs along the Thames. But never you fear! The guys all get back in time to perform, and everything works out in the end. The plot is completely not the point of this film though. The appeal lies in seeing the four Beatles being outrageously wacky, and clearly having so much fun. They all seem to be having a great time, and seem to like each other so much. And they're so young! The guys are all between 21 and 24 - practically babies! It's really charming. We have a renewed fondness for them all. Ah, bless. It may not be overly London-y, but it's a good watch. And we like 1960s London. It looks like fun. Time Spent In London: The first 15 minutes of the film are on the train to London, then it's all London, all the time. Glaring London Errors: We weren't alive in 1964, so we can't really judge, but it seemed pretty good. Oh, but the footage at Liverpool station? That's really Marylebone. More of a Liverpool error, though. Things They Got Right: We liked the 60s dance halls and theatres. Good fun.